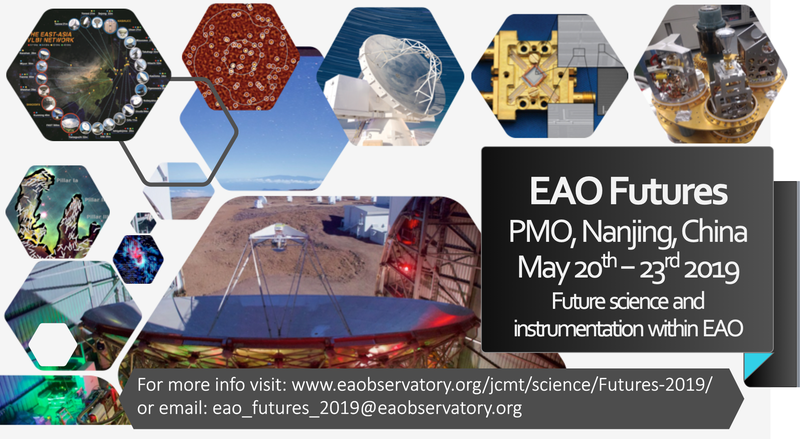 May 20th – 23rd 2019 the East Asian Observatory will host a four day (two half days and two full days) meeting looking at the future of science drivers and instrumentation needs of Sub-mm EAO astronomers. The meeting will discuss a range of topics including the Namakanui instrument at JCMT, the design of a new 850 micron camera for use at the JCMT, the East Asian VLBI project, and instrumentation in polar climates. Talks will cover both the technology involved in these programs and the science cases for such instrumentation. In addition time will be made available for splinter meetings for science programs. It is noted that the science community may wish to use this meeting to discuss current and future JCMT Large Programs. In addition other future EAO projects, such as SUBARU project, may be discussed depending on interest. Astronomers and instrument scientists from EAO Regions are encouraged to attend. In addition and the UK, Canada, Vietnam, Thailand, Indonesia and Malaysia involved in the JCMT telescope are also welcome to attend.